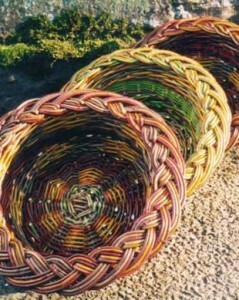 Most baskets are made from willow, cane, rush or bamboo but it is quite possible to make a basket using a surprising variety of natural materials. None of the materials in the baskets are dyed ­ they are all the natural colours of the barks of many different species. The rods are collected in the winter when the sap is down, left to mellow in a shady area of the garden for a short while and then woven before they become brittle ; this can be days, weeks, or even months, depending on the material.